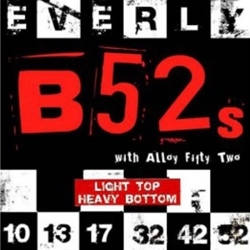 Everly B52s Rocker Alloy Electric Guitar Strings Light Top Heavy Bottom 10-52 9220 9220Cleartone Model #9220Unlike standard electric strings, B-52 Rockers are made of Alloy-52, a unique combination of 48% iron and 52% nickel. With the higher iron content than traditional nickel strings, Alloy-52 is much more tarnish resistant and durable than nickel. The best part about alloy-52 is its highly magnetic giving you brighter tone with better punch and sustain. Combined with high quality pick-ups and the tone is unsurpassed. What is this, crazy world!? Yes, it is. That is the only way to explain great sounding strings with twice the lifespan.